We recently wrote an article covering the #FirefightingSexism campaign started by West Midlands Fire after they saw a tweet by a mom of her 4-year-old girl who thought, because she was female, she couldn't become a firefighter. 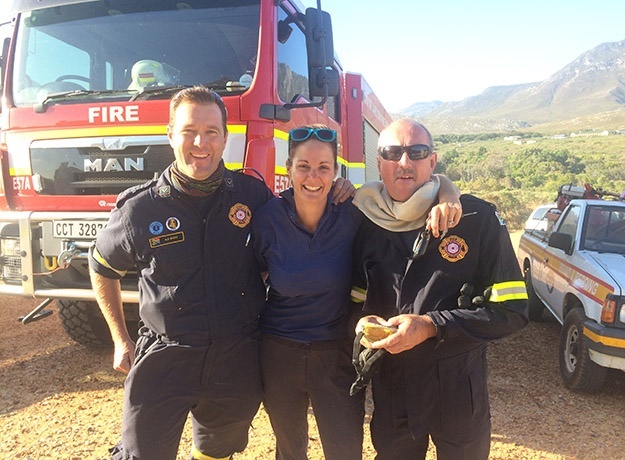 Coleen Johnson, from Cape Town, wrote in to us in response: "I too dreamed of being a firefighter when I was a little girl and I did it! Tell Esmé that she can be anything! Dream big, baby girl!" We interviewed Coleen and she told us all about her journey and how she encourages her girls to be whatever they want to be. On Sunday evening, as I drove home, I saw the mountain bright and sparkly in my rear-view mirror. But this time, it wasn’t the twinkling white lights of hikers making their way up and down Lion’s Head. No. It was a warm light – a burning light. Coleen moved to Cape Town when she was 8 years old and went to an all-girls school. But, she explains, “I’ve never been a girly-girl.” Jumping out of the line of fire was always more her thing and she calls her job "the best in the world”. “I knew from about the age of 7 that I wanted to become a firefighter. It wasn’t a firefighter specifically – I wanted to be a rescuer. When I was in matric, it was a bit of a tossup between going to the fire department or going the paramedic route or going into rescue. "But at the time, rescue didn’t accept females and the fire department was still veeery much on the borderline, you know, with accepting females. So I actually went and did my basic ambulance course and I worked there for a year, then I got into the fire department from there. We speak about the consequences of being new, but different – in an industry dominated by men. 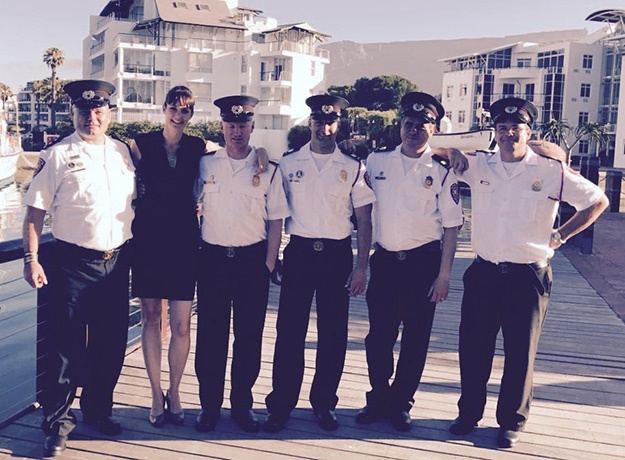 (From left) Andrew Stott, Coleen Johnson and Jacques Loubscher worked together on shift at Milnerton fire station. They're still friends. She tells me two stories, one about her supervisor, the other of her Firefighter One exam. She doesn't go into too much detail but explains what it must have been like to be stuck in a particular mindset. “It was that immediate, oh because you’re female, you don’t know anything or you’re not capable. 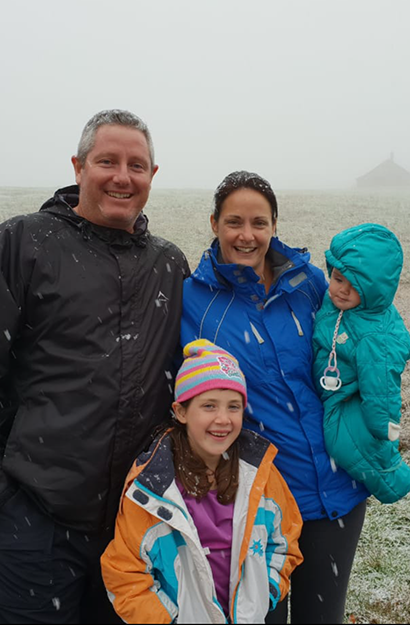 But now, while it did take some fighting, she says in their small town of Pringle Bay, she is after all lined up to be the next station commander. And it was worth the fight. “I’m not saying there weren’t good times – there were good times. And as people learn to know you and work with you and love you, you know, it changes,” she says. She shares more stories with me – there was a reference to roasted chickens with a side order of misogyny – but ultimately she says it was good fun. “I look back on those days and I miss it – I really, really miss it. And I still have loads and loads and loads of friends there. Guys that I’ve worked with that I’m still good friends with,” she jokes. I ask if she was ever scared? Anxious? (From left) L Powrie, C Johnson, M Walklett, J Connolly, S Evans and JC Pollet. Coleen describes JC as her "best guy friend". They joined the service together after working side by side at the ambulance base. We move on, and Coleen is getting lost in everything she loves about being a firefighter – even the element itself ignites something in her. 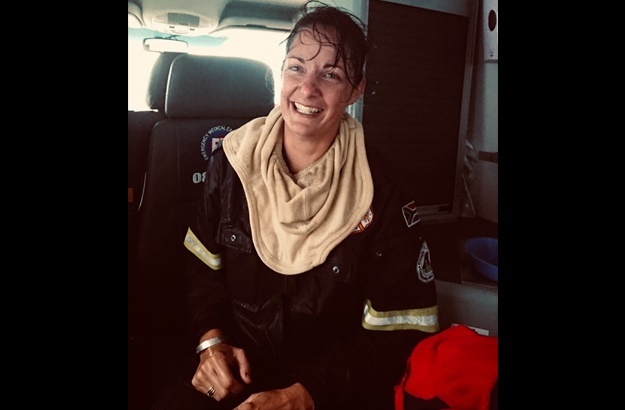 Coleen, "soaked to the bone", right after fighting in the recent fires that engulfed Betty's Bay. Coleen says things eventually got better. They became somewhat “comfortable”. But oftentimes when things start to feel comfortable, there isn’t much room for growth. It was a matter of leaving the life she loved, but for something better. And she wasn’t doing it alone. 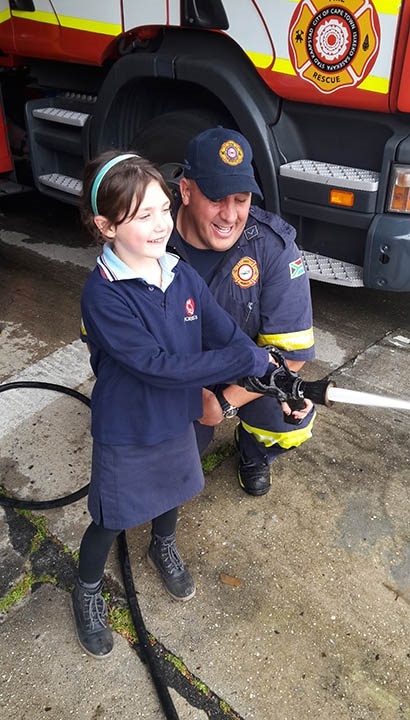 Anna with firefighter Christopher Woolstencroft. "We worked together at Roeland Street Fire," said Coleen, "And he is an absolute legend!" Coleen says Anna’s taken some interest in becoming a doctor like her paramedic dad. “Isla, I think, is a little too small to pass comments,” she said, “But my Isla is going to be my little firefighter one day. I think she’s ready for the world. She’s completely gung-ho,” she jokes. Although Coleen absolutely loves fighting fires, I ask her if Isla were to really follow that same path, if she’d be okay with it – you know, motherly instincts and all. Her advice to a little girl – or boy – with big dreams? “Don’t let anybody stand in your way. If somebody laughs at you turn around and say I’m doing it anyway. There’s nothing greater than living your dream. There’s nothing that makes you happier than living your dream. “Like mommy and daddy,” she affirms, gleefully – proudly. Coleen with her husband and their two gorgeous girls. How are you encouraging your children to pursue their dreams? And do you have an inspirational story you'd like to share with us? 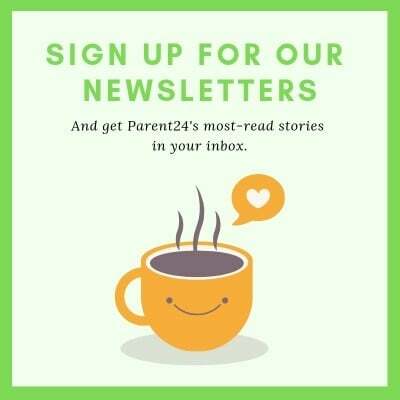 Tell us by emailing chatback@parent24.com and we may publish your stories.